As almost any of my local friends could tell you, I am hopelessly hooked on this recipe. I originally found it in a Splendid Table Summer Grilling handbook I got for joining Minnesota Public Radio (charitable brag), and I think I may have made it every single time I’ve grilled in the last 5 months. I’m not sure I’ve ever found another recipe which has such an insanely out of balance ratio of time, effort and money input for each unit of tastiness returned. This whole thing takes about 5 minutes to prep, it cooks on the same grill and at the same time as whatever else you might be grilling, and the end result is just fantastic. The only complaint I have with this recipe is that it may upstage whatever meat you’re grilling with it! First prep the scallions by rinsing and drying all of them, then cutting off the roots at the bottom as well as the top 2 inches from the green end. The asparagus needs to be rinsed and trimmed as well. There’s a nifty trick for this, which ensures that you will always remove all the tough, fibrous part of the stem. Grasp the cut end of the asparagus in one hand, and then hold 2-3 inches up the stalk with your other. Bend the stalk until it snaps, and throw away the short end. There’s no consistent point that asparagus stems turn from tough to tender, and this method will allow each stalk to break naturally at that point. Place all of the onions and asparagus on a platter or jellyroll pan, then drizzle on 2 tbsp or so of olive oil. The exact amount of each is not that important, but I usually do 2 bunches of scallions and 1 of asparagus. Also, if you’re able to find the smaller asparagus stalks, go for those. 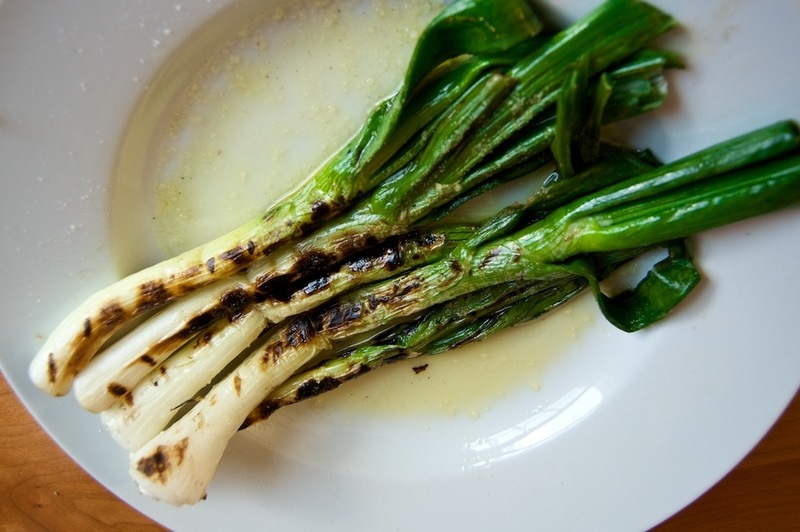 Asparagus, being much denser then scallions, takes significantly longer to cook. The small, thin ones seem to cook at roughly the same time, so those are ideal. Toss the veggies with the oil, and whatever seasoning you want. You could use just salt and pepper, or change it up for your tastes. I usually use Cavender’s Greek seasoning for this, it seems to work pretty well. Don’t go nuts with seasoning the veggies, because after they grill you’re going to top with a balsamic vinaigrette. It doesn’t need to be perfectly executed, just mix balsamic, olive oil, Dijon mustard, garlic, and an herb or two. If you need a recipe to work off of, we’ve previously covered the America’s Test Kitchen vinaigrette recipe here, just make sure you don’t use the full amount. 1/2 cup or so of vinaigrette will be plenty. Grill the veggies for 5 minutes or so, depending on how hot you have the coals. If they start to burn just move to a cooler part of the grill. When everything has a bit of color and has gone slightly limp, it should be ready. Toss the veggies with the balsamic mixture and serve immediately. You can top with some shaved Parmesan if you like, but its damn good as it is.